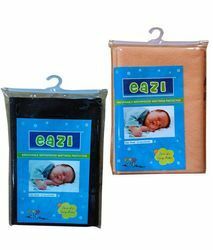 Prominent & Leading Manufacturer from Mumbai, we offer eazi dry sheet, eazi baby mattress protector and baby mattress protector. We have established ourselves as a renowned manufacturer and supplier of Baby Mattress Protector. High quality material is used to manufacture the offered range of products following industry set guidelines. The protectors we offer can be subjected to rigorous cleaning of washing machines at up to seventy degrees of Celsius. Looking for Eazi Dry Sheet ?